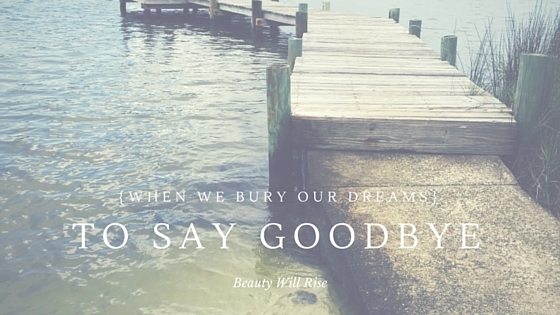 When We Bury Our Dreams - Those Who Dream, Inc.
Our house was full of noise and laughter and life today. Except it wasn’t as loud as it could have been. It’s been nearly two years since our son, Beau was born sleeping, and nearly 8 months since we buried our son Montgomery. You know, I thought that the hardest days would be the funeral, or the day writing their obituary — definitely their birthdays when I would long to bake a cake and put hours into elaborate birthday parties because I’m just addicted to Pinterest. But lately those “hardest” days have hit me square in the face. I’m 28 years old and I have twice buried my dreams. I remember those early days. Josh and I walking barefoot in the dirt of Africa, newly married, and dreaming about babies. We believed in babies as much as we believed in life. We had no idea what was ahead of us. And we wonder, what will come from all of this? After Montgomery died, our friends, the Joyner’s invited us to spend some time at their beach house to get away and try to heal. I was praying God would meet me there. But I had no idea that he would meet me in the face of an older man named Gene. From the first day we arrived, he was around –working, watching the water, cleaning the boats. And as usual, Josh found a friend in him. Gene invited us to go out on the water in his boat one day. He would drive us around and help us see life when all we could feel was death. He wouldn’t ask us questions. He didn’t have an agenda — he didn’t even talk about himself. In fact, by the end of our trip, all I knew about him was that he was kind and a man of few words, and that he loved eating mullet — a type of fish that feeds on the bottom of the Gulf. But when I was around Gene, I knew I was around Jesus.B I didn’t know why, I just knew that God was showing me His face in Gene. He had a look in his eyes that looked like he had walked a hard road. And even though his heart was gentle, you could tell he still carried some of that pain. When we left to go home, Gene walked us out and I knew he wanted to tell us something. In that short time, we had grown to love Gene. He hugged us and told us that he could see how much we loved each other, and to remember to never forget that. And just like that, we left. A few days later, I messaged Gene’s sister-in-law to tell them thank you for the hospitality. I told her how thankful we were to have met Gene. That’s when she told me that Gene’s son had died when he was young. He had walked through a similar road as we were. I wondered if I would still have that same look of pain in my eyes when I grew old one day. We’ve been following Joey and Rory Feek and their journey in battling cancer. They’ve been such an integral part of our journey in grieving our sons, because of their music. Today, for some odd reason, I woke up and the first thought in my head was to pray for them and that today, she was going home. So our home has been filled with laughter and noise and life today. Their music has been blaring through the halls, and this song stopped me in my tracks. One thing I’ve learned from Joey’s journey is the power of being present with those you do have, right now. I’ve had many things change me since our boys died, some for the good and some that trapped me in my grief. For a long time, I wrestled with the fear of losing more of my kids. Or of this place that feels so much better than Heaven to me — Home, with my husband and living kids, being taken away from me. That fear crippled me. When I heard that Joey had died today, I remembered the legacy that she left and the look that their lives gave in how to say goodbye by living fully with those you love. And that, along with their songs, changed my perspective. Take it from me that you don’t want to wait until you’ve buried your dreams to figure out the value of what is right in front of you. Love those that are in front of you. Life isn’t something to be sheltered because of fear of losing it all — or losing it all again. For all of us, our dreams will one day come to an end. But it’s really not an end. It’s an invitation into something much bigger than what we can see. Don’t let fear keep you from enjoying the gift of life that you’ve been given. Don’t let busyness and ambition, and strife keep you from finding the joy in a simple life. Don’t allow yourself to be distracted from the joy that is right there at your fingertips. And don’t waste time because whether we like it or not, we all are running out of that. Above all else, I’ve learned from their story that you really don’t need to say goodbye. But you can live in a way that makes saying goodbye irrelevant. I’ve twice buried my dreams. But I wouldn’t trade my story for anything. Having to say goodbye to someone we love, means that we have had the gift of living life with those we can’t live without. Enjoy Heaven, Joey. Your life lives on.